What is a MESH Image? In 3D computer graphics a polygonal MESH defines the shape of a threedimensional object, which can have realtime lighting effects and reflections, along with animation and interaction. So, what we call a MESH Image is a 360° picture with 3D geometry that gives you the feeling that you are there and that you can literally step into the image. MESH Images is a digital production studio which has specialized on the creation of immersive 360° 3D experiences using innovative techniques and workflows. Let´s step into the image! MESH Images delivers an end-to-end solution for creating, modifying, distributing, and measuring immersive 3D and virtual reality (VR) media on Web, mobile devices and VR headsets. With the Matterport 3D Camera (Pro2) and Cloud Services we deliver an end-to-end system for creating, modifying, distributing, and navigating immersive 3D and virtual reality (VR) versions of real-world spaces on Web, mobile devices and VR headsets. Use Dollhouse View to see the layout of the 3D space as threedimensional mesh model. Switch to Inside View to walk around with a realistic sense of movement through textured mesh. Switch to VR mode at the push of a button or share playlists of VR Spaces with a single “VR Collection” link. Get 360 panoramas & HDR 2D photographs (up to 36 MP) for print & digital communication from every position. Get a weekly full report of Matterport statistics of your 3D models from websites and social seedings traffic. Embed it like a YouTube video and customize the tour experience with a variety of URL parameters. Easily share a space to social media with the tap of the icon in the bottom-right corner. Give contact email and phone number right in 3D Showcase so visitors can reach out to you from their mobile. Generate more engagement by embedding videos, images, audio or links to other spaces with multimedia mattertags. Beautiful tour websites with your logo in the experience drive traffic and SEO value to a website with your individual domain name. Direct your audience to points of interest and offer a sit-back exploration mode. We can deliver a dimensionally accurate schematic black-and-white floor plans within 48 hours. Get very useful technical assets like reflected ceiling plans and registered point clouds (XYZ) for further 3D processing. Show the map adress right in 3D Showcase so visitors can locate your space directly from their mobile. Coming soon – publish immersive Matterport 3D and VR experiences to Google Street View (GSV). 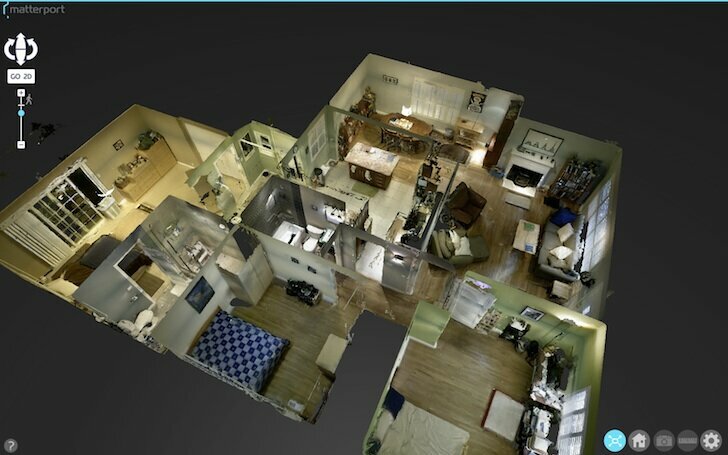 INTERESTED IN MATTERPORT 3D SPACES? MESH Images is a Digital Production Studio for 360° 3D immersive media and Germany´s 1st Provider of Matterport Advanced Business Services. We create high-quality 360° 3D Business Stories for Multi-Channel-Distribution via Mobile, Web, VR, AR and Social Media.